Disease strikes local lorikeets – Northern Rivers Wildlife Carers Inc.
A young Rainbow Lorikeet recently rescued from East Ballina showing signs of Beak and Feather Disease. A disease that robs lorikeets of their ability to fly, has again surfaced in our region. Although the disease is not uncommon, the Northern Rivers Wildlife Carers said the sudden increase in lorikeets presenting with Beak and Feather Disease was unexpected and worrying. Beak and Feather Disease is a virus found in both wild and pet parrots that affects the growth and development of their feathers and beak. The disease although life threatening to parrots doesn’t affect humans. How the disease will affect a bird varies between species and between individuals depending on their age. It also seems that some parrot species are at a greater risk of contracting the virus, and can develop more severe symptoms. 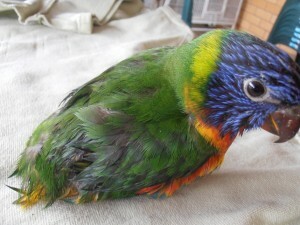 Typically in the Northern Rivers the most common species affected by Beak and Feather disease are Rainbow and Scaly-breasted Lorikeets. In most cases they are young birds, which still have dark beaks, but are missing tail feathers and the longer flight feathers on their wings. Without those important flight feathers, the birds are unable to fly and are commonly referred to as ‘runners’. 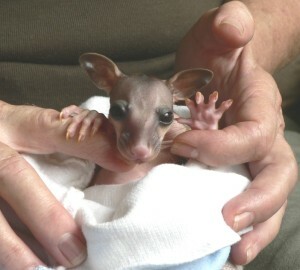 Often these birds are brought into care as seemingly ‘tame’ lorikeets or as babies that haven’t yet learnt to fly. Advice from the Currumbin Wildlife Hospital confirms that there is still no cure for the disease, which is highly contagious and spread via faeces, feather dust, blood and crop contents of infected birds. The virus is so contagious that it can be passed on to young birds whilst still in their nests, with hollows remaining infected for many years. Unfortunately there is also great potential for the virus to spread at communal feeding stations where well-meaning members of the public feed lorikeets. Interestingly, some birds have shown they can survive the initial infection and regrow their feathers again. Unfortunately, whilst the infected bird recovers it becomes a carrier of the disease and goes on to chronically shed the virus and infect other birds throughout the population. The Northern Rivers Wildlife Carers is calling for assistance from the community with managing this disease and asks anyone finding a sick or injured lorikeets call the Northern Rivers Wildlife Carers 24 hour rescue hotline 6628 1866 for further advice. People are encouraged to store the rescue hotline number in their mobile phone for easy reference.